Come and taste Middle-Eastern cuisine at its finest! The warmth of the Mediterranean surrounds you at this charming “middle-eastern café”. 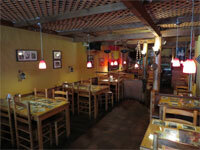 The delightful décor and cozy atmosphere is enhanced by the enticing smells and tastes of the food. At Mezzetta we offer a selection of 40 authentically prepared delicious “mezzes” (appetizer-sized dishes) including 25 vegetarian choices, all very moderately priced. Our menu offers an excellent value for a light lunch and is the perfect choice for an enjoyable exploration of exotic mid-eastern dishes at dinner time. To compliment your meal Mezzetta offers delectable home-made desserts, and specialty coffees or a glass of our increasingly popular Turkish coffee. Ever since Mezzetta opened its doors in 1991, it has become a favourite destination for locals as well as guests coming from every neighbourhood throughout the Toronto area. Our quality and consistency has been praised and acknowledged by clients and critics alike. On Wednesdays, some of Toronto’s finest musicians are featured for those seeking a quaint and romantic venue for good music and great food. For complete listing and further information please visit the “events page”. We will gladly host your functions at Mezzetta (we can accommodate parties of 10 to 45 people) or if you prefer, we will cater to your event or party. For further details you may visit the Take-out menu/Catering page or simply call us. We are confident your experience at Mezzetta will be a memorable and pleasant one, one worth repeating and recommending.